There are still 26 teams competing in the Google Lunar X Prize (GLXP). You probably haven't heard of all of them, but one you should have heard about is the JURBAN team. JURBAN stands for Juxtopia® Urban Robotics Brilliant Application Network and their unique approach to the GLXP will likely serve as a model for future space missions. What makes the JURBAN team stand out from the other 26 teams? First, JURBAN is comprised entirely of underprivileged students, ranging from high school to doctoral students. There are currently 21 students from six states volunteering for the team, but they are looking to increase that number. Students volunteering for the team are directly involved in all aspects of JURBAN's mission, whether it be in the rover design or public outreach. Simple, JURBAN offers the most innovative Moon rover idea. The JURBAN rover called JOLHT, is unique in the design and technique used to navigate the required 500m across the Moon's surface. The rover moves like an earthworm, and has three semi-autonomous parts that will detach and work independently of one another. So while many of the competitors in GLXP will have to focus on one objective at a time, JOHLT will be able to attempt multiple missions simultaneously. Each piece of the rover is equipped with visual, locomotion, communication, power, and computer processing subsystems, making them independent and self-sustaining. What JURBAN is doing is truly ingenious. They are essentially landing three rovers on the Moon. Not only that, but all three are semi-autonomous, meaning they can operate with minimal guidance and communication. JURBAN intends to use two of the pieces in tandem with one another so they can help each other around obstacles. JURBAN even has a contingency plan if all else fails. In an interview with Mars Travel, JURBAN program manager, Blaze Sanders, said he couldn't go into detail, but claimed their contingency plan involves shooting the rover from a device on the lander. The JURBAN team has created redundancies in each of the swarm bots so that even if there are communication or hardware issues they can still operate. The idea of having one rover that becomes many is redundant in itself and ensures that even if one of their swarm bots fails the mission can carry on. The idea of swarm bots is not unique to the JURBAN team, but there has never been anything like it to land on a body other than Earth, so there is no precedent to rely on for JOLHT. However, the semi-autonomous, fuzzy logic software aboard JOLHT is similar to that used in the Mars Exploration Rover's Spirit and Opportunity to great success. In fact, it was so successful that the recently launched Mars Science Laboratory Curiosity uses a very similar system. There is no doubt that other GLXP teams are planning to use similar software. One edge JURBAN has comes from their plans for maneuvering the swarm bots. They plan to use technology created by their parent company, Juxtopia, to control the individual swarm bots. JURBAN is using a re-purposed version of their Juxtopia® Wearable Augmented Reality Goggles, which won a National Science Foundation grant and allows the wearer to see all the rover information on the lense of the goggles. Three pairs of the goggles will be used, each one for a separate swarm bot.Each person. Each pair will enable the user to see how far away their segment is from the lander, what direction its pointing, its heading, and the status of the battery, among other things. How will JURBAN get their rover to the Moon? JURBAN is in a joint partnership with another GLXP team, Rocket City Pioneers, to secure a ride on a SpaceX Falcon 9 Rocket. JURBAN will then use a graphite rocket to navigate the lander to the proper lunar orbit. The graphite rocket is being provided by the Team Phoenicia GLXP team in exchange for JURBAN helping them with their airbag landing system. How will JOLHT land on the Moon? JURBAN is contracting with Warwick Mills® to use airbags and perform a landing similar to that of the Mars Exploration Rovers. Warwick Mills® airbags are currently being tested for use on the Orion Crew Exploration Vehicle (seen on the right). 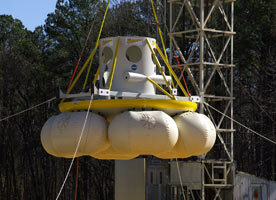 According to the company's their website "worked with ILC, JPL, and NASA in the development of the inflatable Mars landing airbags for the Pathfinder, Spirit, and Opportunity exploration missions." The success of Warwick Mills airbags helps to ensure the JURBAN lander will reach the lunar surface successfully. JURBAN has Summer 2012 plans to conduct drop tests at 60mph (97kmph), the nominal speed at which the lander will impact the Moon's surface. This will help them ensure that the landing will not damage the lander or rover inside. JURBAN currently has eight sponsors: Altium, Lockheed Martin, Tree House Venture, Nurture Form, Moon Pie, Final Frontier Design, Solar System Express, and Tennessee State University. JURBAN hopes to raise $16 million by the end of 2012. To do this they will be seeking out additional sponsors and initiating a grassroots campaign. During an interview with program manager Blaze Sanders, we discussed their planned NASCAR-like strategy for sponsors, which would give companies the chance to have their logo placed on the JOLHT rover in return for sponsoring the mission. If this is successful it could very well revolutionize the process of finding funds for space missions. There is no doubt that all the GLXP teams have a long road ahead of them, but the groundwork set by the JURBAN team promises to give their rover a chance at the $30 million prize! or check out their GLXP team page.